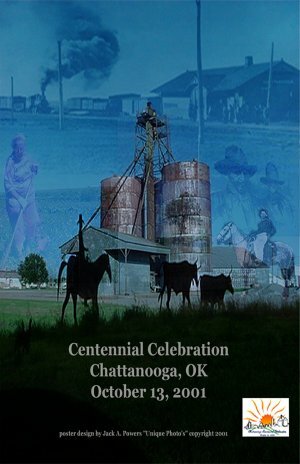 Chattanooga to celebrate their "First One Hundred Years"
And more, will delight spectators of all ages. According to Linda Harper, Celebration Chairperson, the date of October 13 was chosen to celebrate so it would not overlap with neighboring communities that share similar centennial dates, and also in hopes of milder temperatures for outdoor activities. Governor Frank Keating has signed a proclamation in recognition of Chattanooga's coming of age. A full afternoon of events are scheduled to attract everyone from old codgers to whippersnappers. A crowd pleasing favorite is the Outhouse Race. The sure-to-be hilarious Outhouse Race begins with brightly painted outhouses that are mounted on wheels. The outhouse team consists of a sitter which is chauffeured by two pushers. In one smooth move the race is on, the outhouse is maneuvered through an obstacle course to designated stations with the sitter perched inside. At each station the sitter must perform pre-assigned duties and speed across the finish line. The fastest time - wins. It's great entertainment. The courageous pioneers that came to the vast plains were a special breed of people. They mustered up unwavering determination to confront their daily dose of hardships. We invite you to step back in time as you stroll through the farm implement display and observe the marked progress 100 years can make. Watch on as a blacksmith demonstrates old traditions. More fun and entertainment is promised with the blindfolded couples tractor driving contest, children's games, historical displays, a mechanical bull for the brave at heart, poster contests, an all day bazaar and more. Everyone is invited to bring a big appetite and enjoy a free meal from 5-7 p.m. located at Goodknight Park. Sometime near dark-thirty fireworks will brighten the sky with a burst of beautiful colors. The evening will wrap up with a good ole country, boot scootin' dance. "We are very excited about our celebration." Linda Harper stated, "It is the brave pioneers that settled here so many years ago that have our deepest admiration. It was through their dreams that these early homesteaders envisioned the possibilities of this untamed land, their endurance to face and overcome the never ending hardships, and their dedication and desire to make this a great community to live in, which resulted in our fine town of Chattanooga. We invite and encourage everyone to come celebrate this great occasion with us."